To estimate the babbitt temperature at the recommended 75/75 position, the graph on this page illustrates performance comparisons of different types at 3.0 MPa loading. If the temperature exceeds 265°F (130°C), you may be able to reduce temperatures to a more acceptable level by substituting chrome-copper-backed shoe or offset-pivot steel shoes for plain steel shoes. Consult the graph below to determine if this is the case. For those applications where the babbitt temperature still exceeds 265°F (130°C), contact Kingsbury's Engineering Department for additional suggestions, or for details on different load ratings. Our experimental work with a variety of shoe designs and materials indicates that the comparison below can be applied with reasonable accuracy to the J, B, E, and S styles of bearings. 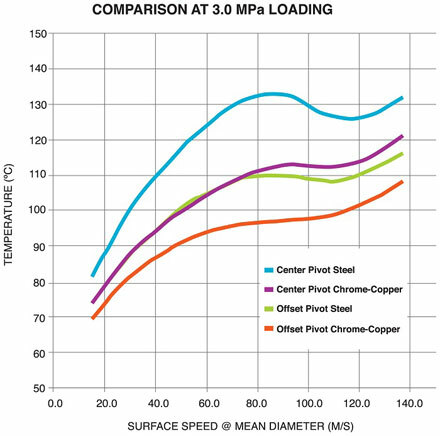 The curves are based upon tests performed in our Research and Development Center using 10.5" diameter, six and eight shoe bearings, operated with light turbine oil [150 SSU @ 100°F; 32cSt @ 40°C] supplied at 115°F (46°C). 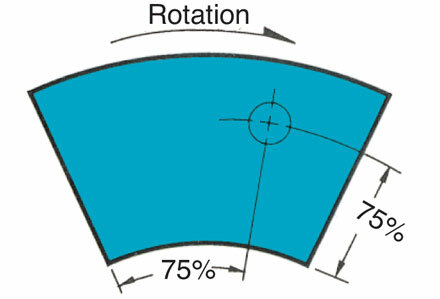 All measurements were taken at the 75/75 position, as indicated on the drawing below.